The UAS Auke Lake Campus is located on lands originally inhabited by the Tlingit Indians. Tlingit, meaning "The People," are divided into Moieties, which means "each of two parts." There is the Eagle moiety and the Raven moiety. In March 1993, the UAS Auke Lake Campus was given a Raven totem pole. The pole was carved by four Tlingit carvers from Haines during an exhibition at the 1964 World’s Fair in New York, after which it was dedicated and displayed at the Nikiski Standard Oil (later Chevron) refinery on the Kenai Peninsula. When the facility was sold, Chevron wanted the pole returned to Southeast, home of the Raven people, and generously donated the pole to UAS. After accepting the gift of the Raven pole, UAS became aware that, without an Eagle pole to complement it, the Tlingit sense of balance between the moieties would be missing. One of goals of the UAS Totem Fundraising Campaign is to teach students about our local Native cultures and to honor them by correcting the imbalance of the moieties through the commission of an Eagle pole to match the Raven. 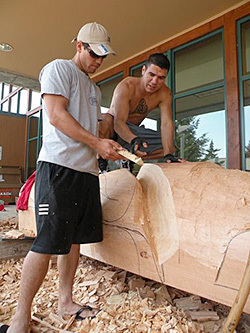 Brothers Joe and T.J. Young were hired in 2009 to carve an Eagle totem for the University of Alaska Southeast (UAS). The pole will balance the Raven totem already on campus. In Southeast Native society, people are either of the Raven or Eagle moiety and both sides need to be represented for social and spiritual balance. The project is sponsored by Sealaska Heritage Institute and Sealaska Corporation, which donated the 15-ton, 45-foot, red-cedar log. The artists are Sealaska shareholders who live in Hydaburg on Prince of Wales Island. They have carved other totems, including a 40-foot pole for the Sitka National Historical Park and a 32-foot crest pole for the Hydaburg Totem Park. Totem poles are an ancient tradition of the Indian tribes of the Pacific Northwest Coast. Historically, a totem was raised for several reasons: in honor of a deceased elder; to show the number of names and rights a person had acquired over their lifetime; to record an encounter with a supernatural being; or to symbolize the generosity of a person who sponsored a Potlatch ceremony. Today, totem poles are carved for both Natives and non-Natives. The poles have come to represent Northwest Pacific Coast Native tradition and pride and are considered works of art. Alaska is facing a cultural education crisis: Alaska currently ranks 50th, or last, in the number of ninth-graders who will likely have a bachelor’s degree in 10 years. These figures are even more dire for Alaska Native students. Here in Juneau, Alaska Natives have composed 40 to 45 percent of the dropouts from local high schools in the last four years. 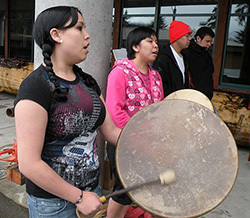 During the Fall08-Spring09 Academic Year, UAS served 296 Alaska Native students at the Juneau Campus and 493 throughout Southeast (all campuses). The Raven and new Eagle poles will serve as a proud reflection of our Native Students’ commitment to getting a college education.